Since New York’s Labor Law provides some of the best protections to workers in the nation due to the requirement of safety equipment for workers, I was intrigued with a post from Walter Olson at Point of Law describing it as the nation’s most employer-hostile law. Having checked out the link Olson used, it is understandable why he has that opinion. 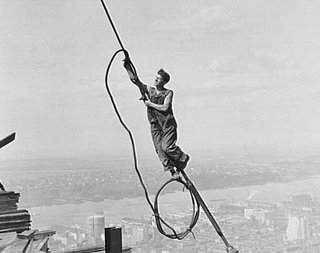 Olson’s link brings us to The Worker’s Comp Insider, with a post entitled: New York Labor Law: No Such Thing as a Free Fall. This is false. While New York’s scaffold law, and the case law that flows from it, does provide for strict liability for injuries regarding falls in some circumstances, this only applies to injuries resulting from a failure to provide the proper safety equipment. Mostly this is for work that occurs at elevation, though there are other safety requirements for elevator shafts, stairwells and the like. Additionally, it does not apply to the recalcitrant worker whose injury is brought on by his/her failure to use safety equipment that has been provided, nor to the worker who is injured solely due to his or her own negligence. The claim that strict liability applies to “any injuries resulting from a fall” is simply wrong. There is no liability without a violation of safety standards, and that violation must have been a cause of the accident. New York is currently one of the safest states in the nation as a result of construction laws that hold people accountable for violating safety standards. And as my dad once told me, if it ain’t broke, don’t fix it. I find it odd when I see people argue for looser standards that would inevitably bring on additional injury and death to an already dangerous job. Personally, I refuse to put corporate profits ahead of human lives.